Books on Cancer? We have a veritable library! We found that it didn't take long to accumulate a bunch of reading material on the subject. 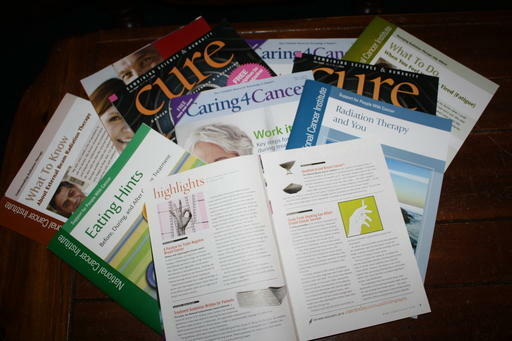 We received brochures, booklets, magazines and other assorted reading manuals at every doctor and hospital visit we went to for the first month or two. Good material. I won't argue that, but boy is it dry and boring. We'd flip through the lists of do's and don'ts, the articles on possible side-effects, and the diagrams of proper anatomy and just throw them down on the coffee table. We wanted to read something with a little heart and soul. Something from a cancer survivor. Preferrable a pancreatic cancer survivor! Or okay, anything uplifting to bouy us along on our journey. What follows are some of the books on cancer, and other important stuff that we've read and want to pass along. Let's face it, cancer is only a part of the journey. We're dealing with a multitude of issues along the way. We have found the following books to be well worth your time and effort. Some speak directly to the cancer patient. Other books are great if you are walking alongside a loved one or friend. Mom and I are picky about what we read. There are just so many hours in a day, and we choose to use that time wisely! Or as wisely as possible. Randy Pausch was a professor at Carnegie Mellon University when he was diagnosed with pancreatic cancer. This book is an extension of his Last Lecture. He writes with heart-warming candor and has a joyful energy. The crux of the book is really about leaving a legacy for his three children, but in a brilliant stroke, he has given us all a newfound appreciation of life, and the desire to make the most of what we've been given. Yes, he talks about his pancreatic cancer and even shares a little of his treatment and the physical mountains he's had to climb, but most of all he shares how to "Really Achieve Your Childhood Dreams." A worthy read, and a definite must-read for our list of books on cancer. 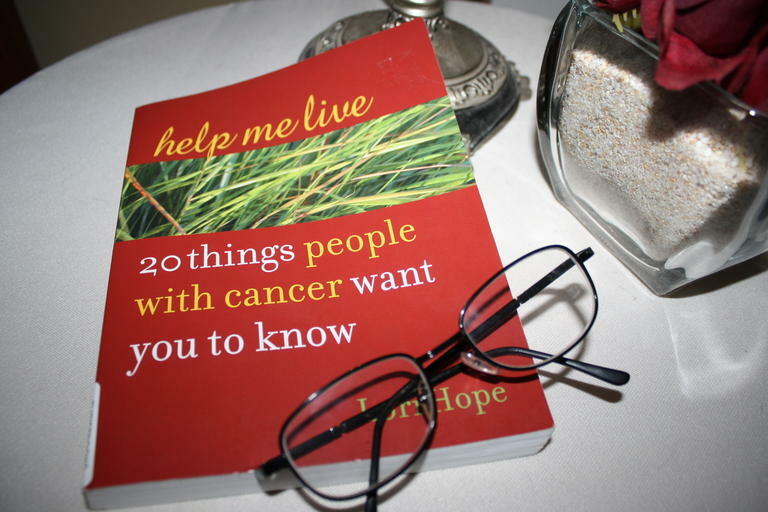 This is a wonderful book compiled by a cancer survivor herself, Lori Hope. It's a perfect read for those of us who don't have a clue what to do when a loved one is diagnosed with cancer. In this book, Lori interviews countless cancer patients and asks them the question: What do you want people who haven't been diagnosed with cancer to know? There are literally hundreds of stories, quotes and suggestions of things to help you navigate the tricky path of caring for your loved one's feelings at this enormously difficult time. Many of the anecdotes are amusing, funny and uplifting. This is a definite must-read for anyone touched by cancer. What can I say? All the Chicken Soup Books are great. This one is no exception. It includes 101 stories of cancer patients touching on subjects such as the fear of diagnosis, the difficulty in letting go, dealing with unfinished business and a score of other often dificult, yet inspiring and always touching topics. Both mom and I were able to glean much from the way other cancer patients dealt with their diagnosis, and we came away uplifted by the resilience and joy of the human spirit. Another must-read on our list of books on cancer. I am including Ann's book here because it has been such an inspiration to us. No, she is not a cancer patient, nor a cancer survivor, but her story resounds deeply within our souls. It is a dare to live fully right where you are, with all your weakness and infirmity. She is no stranger to heart-wrenching grief, and she has a way with words that is both lyrical and beautiful. 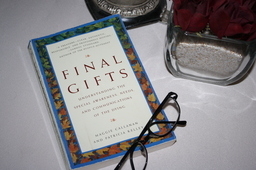 If you are seeking a way to make sense out of the life you've been handed, cancer and all, then do yourself a favor and include A Thousand Gifts on your must-read list. Heaven is for Real is the story of Colton Burpo and his extraordinary trip to heaven and back. Told by his father, it recounts Colton's miraculous recovery from a burst appendix and his astounding near death experience. It is filled with an innocent, yet powerful faith in the reality of an eternal heaven. For a moment the veil is lifted and we are given a glimpse of the wonders, the peace, and the majesty of heaven. For mom and I, this book filled us with an encouragement and expectation of the joys awaiting us. Heaven is for Real is a definite Must-Read! Have you ever wondered what dying will be like? Or been afraid of death, even if your faith in an afterlife is rock solid? Then you will find this book, Final Gifts, to be a treasure. Written by two inspiring hospice nurses, the stories they share not only calm the fear of death, but give revealing insight into the dying process. They have taken a difficult topic and tendered a sensitive, compassionate book filled with hope for each of us.